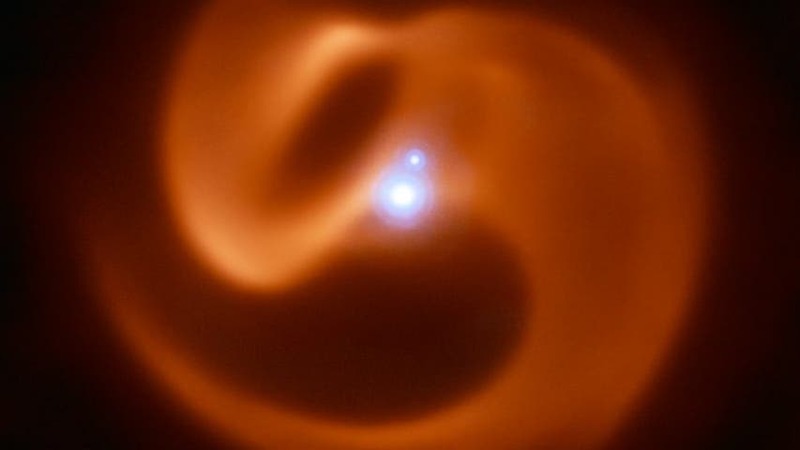 This serpentine swirl shown below, captured by the VISIR instrument on ESO’s Very Large Telescope (VLT, has an explosive future ahead of it; it is a Wolf-Rayet star system, and a likely source of one of the most energetic phenomena in the Universe — a long-duration gamma-ray burst (GRB) . The VISIR instrument on ESO’s VLT captured the stunning image at the top of the page of the newly-discovered massive binary star system. With 2 Wolf-Rayet stars orbiting each other in the binary, the serpentine swirls surrounding Apep are formed by the collision of two sets of powerful stellar winds, which create the spectacular dust plumes seen in the image. The reddish pinwheel in this image is data from the VISIR instrument on ESO’s Very Large Telescope (VLT), and shows the spectacular plumes of dust surrounding Apep. The blue sources at the center of the image are a triple star system — which consists of a binary star system and a companion single star bound together by gravity. Though only two star-like objects are visible in the image, the lower source is in fact an unresolved binary Wolf-Rayet star. The triple star system was captured by the NACOadaptive optics instrument on the VLT. The system, which comprises a nest of massive stars surrounded by a “pinwheel” of dust, is officially known only by unwieldy catalog references like 2XMM J160050.7-514245. However, the astronomers chose to give this fascinating object a catchier moniker — “Apep”. That sculpted plume is what makes the system so important, said Peter Tuthill, research group leader at the University of Sydney. “When we saw the spiral dust tail we immediately knew we were dealing with a rare and special kind of nebula called a pinwheel,” Professor Tuthill said. Some of the most massive stars evolve into Wolf-Rayet stars towards the end of their lives. 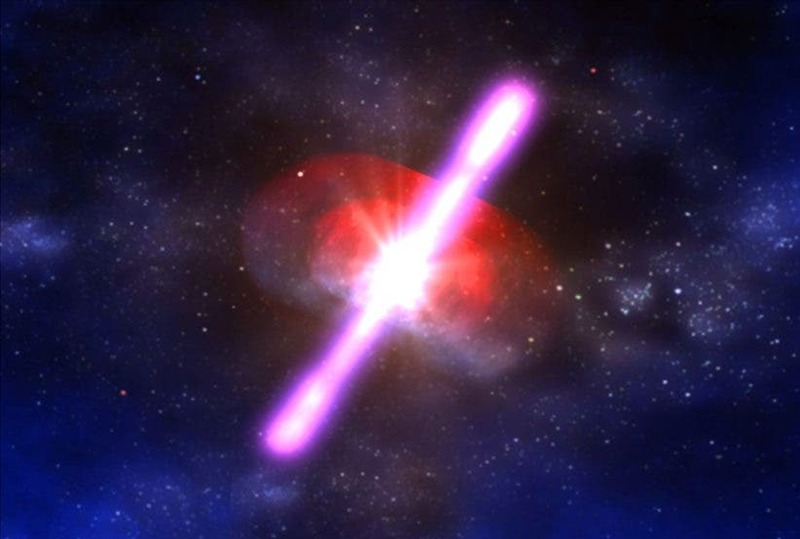 This stage is short-lived, and Wolf-Rayets survive in this state for only a few hundred thousand years — the blink of an eye in cosmological terms. In that time, they throw out huge amounts of material in the form of a powerful stellar wind, hurling matter outwards at millions of kilometers per hour; Apep’s stellar winds were measured to travel at an astonishing 12 million km/h. Image credit: ESO/Callingham et al.